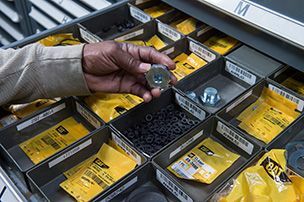 Thanks to the excellence of the international Caterpillar network, the Monnoyeur Group’s logistical organisation and its world-class ISO 9001-certified parts service, Eneria can guarantee high availability and fast delivery of spare parts. We have the parts you need to get the job done. 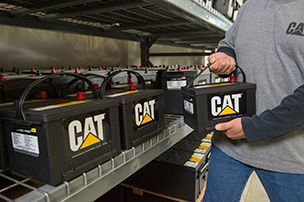 Cat® parts are built for durability, reliability, productivity, environmental friendliness and reuse, and are manufactured to precise specifications. Whether you’re managing a few machines or an entire fleet, whatever your business, our teams stand ready to serve you. Contact us by email. 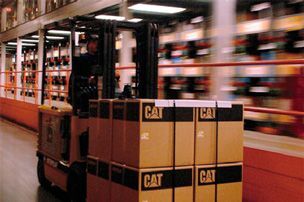 For years, we have had a logistical platform that will ensure you have the highest availability and speediest delivery of Caterpillar spare parts anywhere in France. With more than 107,000 products in inventory stored in over 11,000 m2, there are 130 employees who will do all they can to send your package as soon as possible. 1,800 orders delivered in less than 24 hours..
110 tonnes of merchandise pass through our loading dock each day. next-day express delivery everywhere in France. Our order desk is open Monday to Friday from 8 a.m. to 6 p.m.